For the next selection on the highlifeturntable I have selected the track Iwe Adimma by Obiajulum Sound Power led by Pat Enebeli. I have written about Obiajulum before. He was active in the late 70's through mid 80's. I have seen his name translated to be contented heart or more descriptively by Ikon Afrik as my heart is at peace and joyful. 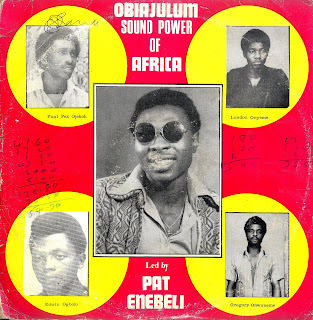 The liner notes announce on this LP that they are changing their name from Ikwete Super to Obiajulum. I first heard a track from this Yamson release on the blog hosted by Superfly Records in Paris in 2016 and have been looking for the LP ever since. It was worth the effort to find it. Its really hard to describe how good this music is. The guitar playing and vocals are impeccable from a Ukwauni point of view. Check out the riffs at the 2 minute mark and around the 4.45 mark. Just beautiful. I have also included a link to the link at Superfly.